Many locals agree that fall is the absolute best time to be in NYC, thanks to refreshingly crisp days, a bustling cultural calendar, and Mother Nature's vibrant autumnal display. Happily, even in the midst of Manhattan's concrete jungle, patches of nature abound, and fall leaf-peepers will be rewarded with kaleidoscopic displays of crimson red, golden yellow, and fiery orange leaves, if they get their timing – and scouting locations – just right. So before you rush out of the city in search of fall's finest hues, we've done the leaf-crunching legwork to round up this list of five fun ways to see fall foliage in the Big Apple. Tip: NYC foliage typically peaks in late October (right around Halloween, another fall rite of passage that NYC does right!). You can keep up-to-date on just when those bursts of fall color are most likely to appear, via New York State’s helpful fall foliage report. To start off with the obvious, a walk, hike, or bike ride through Central Park, with its some 20,000 trees, is the perfect way to enjoy the changing seasons in the city. Some hot-spots for viewing include the areas around The Pond, The Mall, and The Ramble on the southern side of the park; The Reservoir, situated mid-park; and the North Meadow, North Woods, Conservatory Garden, and The Pool on its northern end. Look out for the reds of red maples, red oaks, and black cherry trees; the yellows of hickories, American elms, and gray birches; and the oranges of sugar maples. For added fun, rent a rowboat from the Loeb Boathouse; or consider signing up for an official Central Park walking tour for expert insights into park history, flora, and fauna. There are plenty of great parks in Manhattan beyond Central Park. 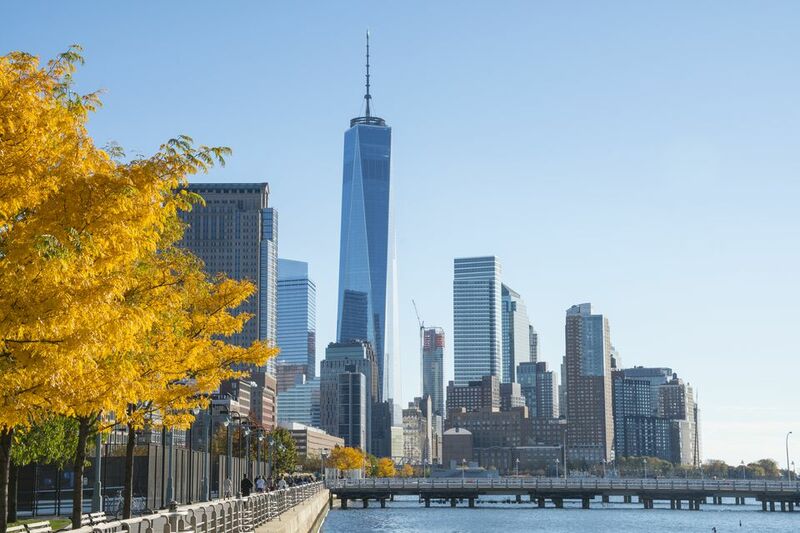 For those with the very best leaf-peeping landscapes, make way for the transporting swaths of green spaces in some of Manhattan's more northerly reaches. Some of the top contenders include the 30,000-acre Fort Tryon Park, which overlooks the Hudson River, and is home to the transporting medieval Cloisters museum (part of the Met); Linden Terrace, one of the highest points in Manhattan, which overlooks the Hudson River and foliage-fringed Palisades; and the Heather Garden, with its many perennials, shrubs, and trees. Other top tree-filled parks to seek out include Highbridge Park (check out the trail along the Harlem River which passes the landmarked High Bridge and High Bridge Water Tower) and Inwood Hill Park, with its native tree-lined trails lined with oaks, hickories, and tulip poplars that overlook the Hudson River and the Palisades. Several sightseeing cruises whisk away guests from Manhattan up the Hudson River, affording them front-row seats to some spectacular fall foliage along the riverbanks. Classic Harbor Line, with its classic fleet of sailing schooners and 1920s-style yachts, is one of our very favorites for fall sailing. Try their 3-hour brunch or 4-hour lunch sailings that board at Chelsea Piers for a run north on the Hudson River into the Hudson Valley, sailing past landmarks like the George Washington Bridge, the Cloisters, the Palisades, the Little Red Light House, and the Tappan Zee Bridge. Another top pick is Circle Line's full-day Oktoberfest Bear Mountain cruises, which bring guests on weekend outings up to Bear Mountain, from Midtown. Onboard, guests can enjoy live oompah and polka bands, German beer, and traditional Oktoberfest dishes (like schnitzel and bratwurst). There's ample time to disembark at Bear Mountain State Park to enjoy the foliage via a hike or stroll, before returning to the vessel for the trip back to the city. Other fun options include New York Water Taxi's fall foliage sailings from the South Street Seaport to the Hudson Valley; the line also runs ferries to Sleep Hollow that are primed for foliage – and Halloween – season. Look, too, for Spirit Cruises' dining-and-sightseeing fall foliage lunch buffet sailings up the Hudson, leaving from Chelsea Piers on select October weekends. The network of parks along the Hudson River waterfront (including Hudson River Park and Riverside Park) offers a series of Riverside, traffic-free bike paths, stretching from Lower to Upper Manhattan. Whether you have your own bike or rent one from CitiBike or a bike shop like Blazing Saddles, the path, tree-lined at times, is scenically wedged between sweeping skyline views, pretty park landscapes, and panoramas of the Hudson River and NJ waterfront (including the majestic Palisades, across from northern Manhattan). You might consider joining a guided bike tour along the route, too: Bike and Roll NYC, for instance, offers a Waterfront & Central Park Tour, which combines the water-front ride along the Hudson with a run through Central Park for the perfect fall foliage one-two punch; note that the 2- to 3-hour tour runs for about 9 miles. For a birds-eye perspective of the fall spectacle, paired with a tipple or two, consider taking your leaf-peeping to new heights – literally. In a city that's gaga for rooftop bars, you can pick out one with some stellar views over Central Park for a brilliant fall-inspired backdrop. A few top contenders that meet the leaf-peeping criteria: The Roof at the Viceroy New York; The Met Roof Garden Bar; or the Bar SixtyFive in Rockefeller Center.